Gabe & Kate 2008: I Heart Martha! 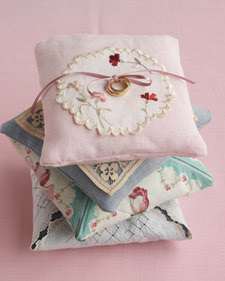 Look at these adorable ring pillows made of vintage hankies! How lovely! I need to make these now! :) I bet she learned how to make these in prison! Seriously, though, I really do heart Martha.